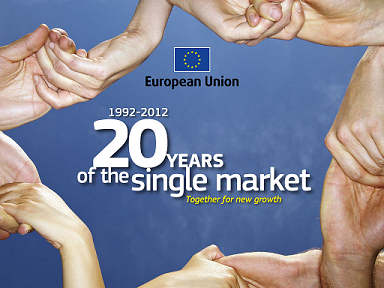 As part of the 20th anniversary of the European Single Market, a Single Market Week will be organised from 15 to 20 October 2012 with events taking place in cities across the 27 Member States of the European Union. This initiative builds on the Single Market Forum of Krakow in October 2011 to which CEPI participated. Through these events, it is hoped to bring together European citizens and businesses with Members of the European Parliament, the European Commission, the European Council and the Member States to celebrate and reflect on the past, present and future of the Single Market. The Single Market involves 50 million consumers, 21 million companies, €2 800 billion of intra-EU trade, and €1 500 billion of trade with the rest of the world. Consumer expenditure accounts for 56% of EU GDP. The more the 500 million EU consumers are able to make informed choices, the greater the impact they can have on strengthening the Single Market and on stimulating competition, innovation and growth. European citizens have unprecedented opportunities to, live, study, travel and work in the EU country of their choice. They can shop around for the cheapest goods and services. Their rights as citizens and consumers are protected by EU laws throughout the Union just as they would be in their home country. This is all down to the creation of the Single Market, in which people, goods, services and capital can move freely. In existence for 20 years, the Single Market has achieved much, but is still a work in progress, which is constantly being refined, updated and expanded where necessary. During the events that will take place all over the European Union, Europeans citizens, students, experts, businesses, national and local public authorities will be provided with opportunities to discuss the main achievements of the Single Market during the last 20 years but will also look ahead, and share their views and expectations on the main challenges that the Single Market must overcome in the future. These events will be organised by the 27 Member States of the EU, in collaboration with the EU Representative Offices in their countries, and will include forums, fairs, conferences, exhibitions, radio and TV programmes, quizzes etc.